BICC and the US Consulate General in Düsseldorf were pleased to invite to the talk “After the Munich Security Conference 2018: Security Challenges for the Transatlantic Partnership” by Amanda Sloat, Brookings Institution, on 21 February 2018. 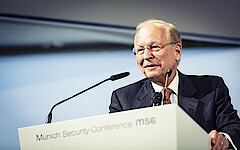 With a high-ranking delegation of US-government representatives participating again, this year's Munich Security Conference was keenly awaited. Most certainly, the new national security strategy of the Trump administration was in the focus of many discussions there. Amanda Sloat of the Brookings Institution participated in the Conference and analyzed the results from a US perspective in her talk.